France Is Slowing Down, So Are We. It appears the French have introduced a new 80kph (49.7mph or 50mph to most people) on all their countryside single carriageway roads. This is supposed to be a 2 year experiment to prove or disprove whether or not the reduced limit will save lives. My understanding is - this applies to countryside or rural roads that do not have a central reservation, barrier or other physical delimiter. So roads that were in the past 90kmh are now 80kmh EVEN IF THE SIGNS SHOW 90 KMH!! Please note I'm not a French lawyer or in touch with the authorities so be sure to double check this information. The point of this missive is to contemplate my thoughts on this. Here in North West England I have noticed many of the major and quite a few of the minor roads that were once "national speed limit" (60mph) are now 50mph. Year in year out as I ride around I find 60s are becoming 50s, 50s becoming 40s and many of you will see 30s becoming 20s. 20 is the new 30 doncha know. What is the point!! Eh? No no no, I'm not asking what is the point of lowering the speed limits. Depending on your point of view lowering speed limits is about saving lives or it's about the governments of the world being fun hating killjoys. "They" don't want to save you and your children's lives, "they" want to control and suppress you by making you ride everywhere at 5mph and make your life hell. Pick a side. No, what is the point having a big powerful motorcycle? Unless you have access to a racetrack or you really don't give a toss about the law, your licence, your insurance or being thrown in prison then having sufficient power enough to achieve 180mph seems pointless. My 500 can (allegedly) struggle it's way up to 110mph, 40mph faster than the maximum permissible on any UK road and sufficient to see me on the very wrong side of a ban and a hefty fine. As the number of roads in my area where I can legally travel at 60mph tumbles I often find the 500 feels stifled, excessive, frustrating and bloated. The 125 has little trouble reaching 50mph and at least the engine is breathing and working rather than barely ticking over. I know I know I know I know... Big powerful motorcycles accelerate very quickly. That sense of acceleration is the thrill not necessarily the actual speed achieved. We might only legally be allowed to travel at 70mph on a motorway but it sure is fun getting up to 70mph in under 6 seconds on a vehicle that costs less than the cheapest cars available. Another few grand will see you doing that in under 3 seconds. Another advantage of big powerful motorcycles is the ability to travel the motorways at legal speeds with the engine barely running let alone breaking a sweat. My long suffering CBF125 does a lot of motorway work and it manages it fine. Even so I have to admit the engine is working very hard and a strong headwind will reduce my speed to a level that leaves me vulnerable to other road users travelling considerably faster. Considering this what would be the ultimate solution for a rider such as I? I'm imagining a 250-300cc engine. The first 5 gears are short with 5th being geared to be right on the max power revs at 50mph (about 8,000 revs probably). 6th gear is an overdrive, intentionally tall to provide motorway cruising with good economy and without the engine screaming. With the lower gearing acceleration could be sharp and rapid, the sensation of riding the bike and using the gears could be retained. All this would be thrilling and yet still within the legal limits. The tall 6th gear would prevent motorways from being a screaming engine nightmare. Of course the smarty pants among you will poke holes in my cunning and devious plan. It's all of no consequence anyhow because we'll all be electric soon enough. When we're all electric and self-driving/riding the computers will prevent the notion of speeding. I guess us brits will have to slow down a bit when travelling in France. The French, well I guess the French will ignore the 80kph limit the same way they ignore the 90kph limit. 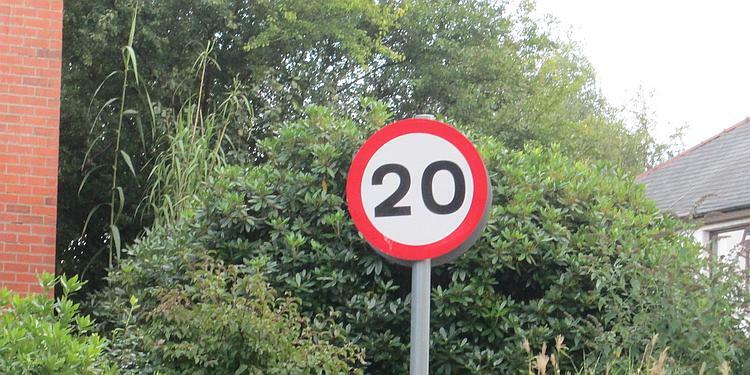 Yeah it's one thing to have a speed limit, it's quite another to believe people will actually obey it. Lower speed limits mean more revenue from speeding tickets! Oh 'eck it's getting political now! It's probably a mix of things including saving lives and cutting down on spending. After all, there's a LOT of money goes into repairing and rebuilding a broken biker/driver. It's not just the ambulances, helicopters and hospitals, it's the police, fire brigade and highways department (replacing damaged roads and street furniture). On top of that, the Police reckon it costs between 1.5 and 2 million quid to fully investigate a fatal road accident!! Jeez, I wanna be an investigator! You as an accident investigator would not receive the full 1.5 million pounds Tom. The accident investigation after my little bump was carried out by a trained police officer as such the typical accident investigator will be on an police officer's wage. Not sure where I heard/read it, but I understand that roads that are NSL have to be maintained to a certain standard. Dropping the speed limit on these roads allows the councils to get away with not having to maintain said standard (yes, I'm looking at you, Northamptonshire County Council, you incompetent bunch of trough gobblers - where's our £1.4bn?) So many roads in my area are a 50 instead of the previous 60. then again, they don't need to lower the speed limit to get people to drive slower, the potholes do that job. Yes, I'd heard that too Doug. I heard that if the speed limit is over 50 then the road has to be resurfaced properly with tarmac and then rolled, whereas if it's 50 or under they can do the scrape, spray, and gravel scater thing which is of course much cheaper. This may just be an urban myth, but it has the ring of truth as far as I'm concerned. So what you're saying is the 60 to 50 epidemic is councils trying to save money? I would be interested if anyone can provide any certainty to this - it's not that I don't believe your sincerity, I'd just like to be sure either way. It certainly sounds feasible with the way council budgets are. I wonder why it is we only have increments of 10mph not 5mph?, ie 35mph, 45mph,etc. Of course Ren the main point of having a bigger, more powerful, faster accelerating bike is about bragging rights; mine is bigger than yours etc. No not that, bikes. Stop sniggering at the back. BUT, I do appreciate a motorcycle that can hold a good turn of speed, whilst loaded to the gunnels with pillion and luggage. This good turn of speed would be about what is allowed in the EU, typically 85 to 90 ish on the Autoroutes. After all what's the point of travelling on god awful Autoroutes if you can't get to your destination quicker. Do you need 180 bhp for this, obviously not. With regards throwing chippings on derestricted roads, all ours are covered in chippings despite the national speed limit. Whereabouts are you Upt'North? I presume 85 to 90 refers to KMH not MPH as I'm more familiar with in the UK. I fully accept that touring especially on motorways is easier on my 47bhp 500 than my 11bhp 125. But to anyone with a smaller capacity machine - this is not an excuse to buy a 100bhp plus motorcycle. What is the best bike for touring? The one you have already, just make it happen. I think for solo riding with a large luggage load my 47bhp 500 is more than sufficient if you are keeping to legal limits. In fact Sharon's 27bhp 250 is perfectly adequate at legal speeds. If like myself you're happy at 55mph then a 11bhp 125 is fine too. And if you don't want to do motorways then a 50cc step through scooter is fine. 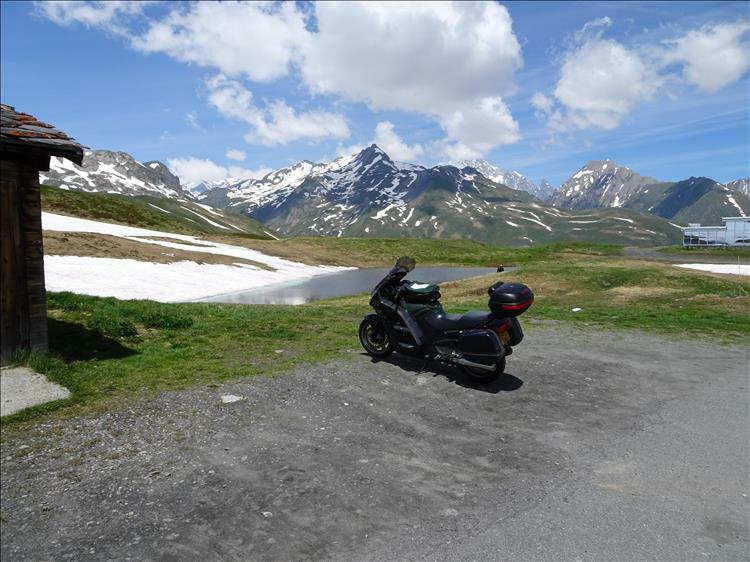 There are thousands of people touring on bicycles so you do NOT need a GS1250A to see the world. Power is a luxury, not an essential. It's also worth noting I'd rather have a smaller cheaper bike and some money left over for a trip than to have a large ego-booster and no money to go anywhere. England Ren, but about as far North as you can be without wearing a kilt and blowing into a noisy bag. No I was referring to MPH, but not in the UK, I do tend to stick to 70/75 ish on UK motorways and Dualed A roads. Any more would be foolhardy. But when trying to cover Europe with some progress and aplomb and when facing 4 to 500 mile days then I do like to ride at the speed limits or pinch a little. I think most EU Autoroutes are around 130 kph. I also like to potter at 80 kph on French D roads etc but if you've ever ridden on French D roads you will know you get nowhere fast. I also have been known to like keeping a little in the bank balance, so I appreciate your point of view. My latest pleasure, owned for 5 years and 20000 ish miles is a 98 pan European which probably cost half of your 500. And it's still worth roughly what I paid for it. 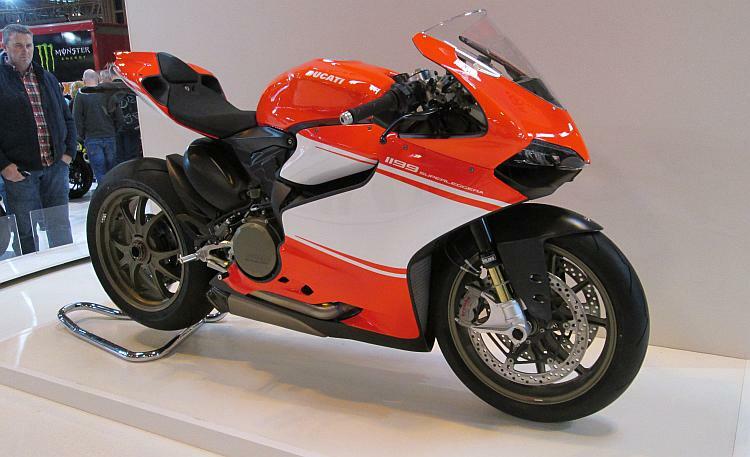 Amazing bike too. The 100 ish bhp is more than adequate. Aaahh, the Pan. A stoic and reliable machine built for carrying people with things to far off places. Save for the fuel consumption this is my kinda bike. I am often criticised by my friends for worrying about fuel consumption, "it's about the smiles not the miles per gallon". Yeah that's fine if you're doing the usual 2-5 thousand miles per year but at 20,000 fuel bills soon mount up. So where was this image taken? I'm reminded of The Alps but I'm quite unsure. 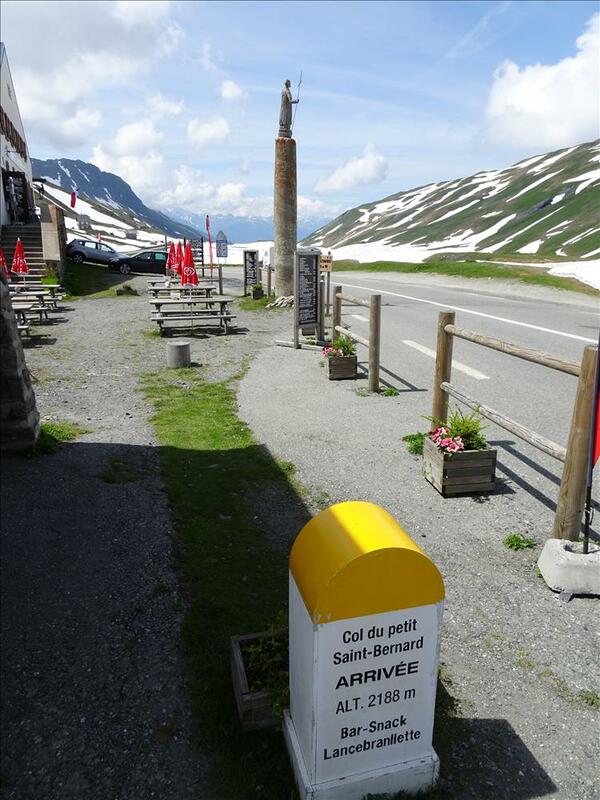 It's the Col du Petit St.Bernard in the Alps between France and Italy. 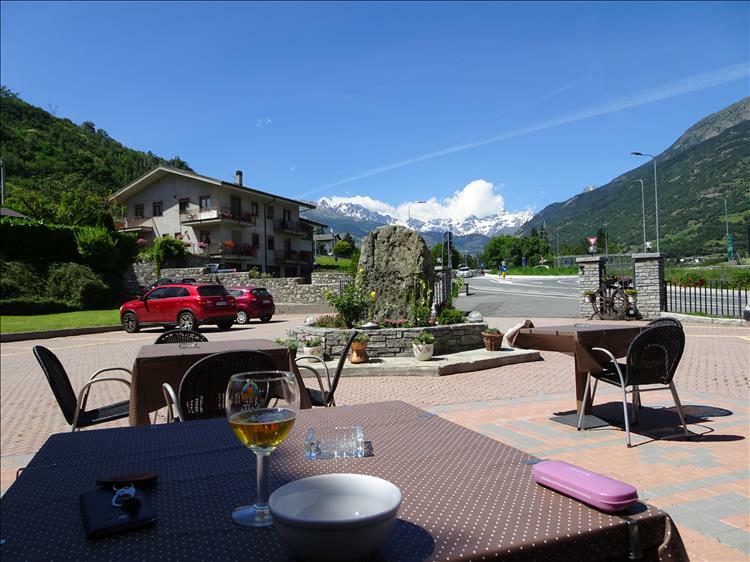 It was a short riding day before an early beer in Aosta. Why would you rush a day with views like that hey. It was a lovely temperature as well considering the altitude. The bike averages about 50 mpg, but obviously physics as always gets in the way when pushing on. I would think it returns mid 40's when in, let's get there more. So you've got 250 to 300 mile range. Wife and I spent 3 weeks this summer in France and Belgium (also 80kph speed limit on rural roads) and didn't find it a problem at all. 'Fast' and agriculture (there's a lot of it on French roads) don't mix well. Here, all major routes in the Peak District (my local playground) are also 50mph but that doesn't stop the idiots. Three weeks ago a biker estimated at doing 120mph (in a 50 limit) hit a motorhome pulling out of a campsite. He killed himself and wrecked several other lives at the same time. The problem with making a law is that concomitant should be enforcement but as we know, the Police have now become an 'endangered species' because of Government spending cuts (thats another issue - don't get me started!). Speed limits are there to save lives. There's a time and a place for speed. Motorways (within sensible limits) and the track if you need to go all out. You see - being me - I see both sides. This weekend I took a 200 mile ride up to Leyburn in Yorkshire. While my friend and I were not troubling the law we were rather enjoying curving the corners and as the IAM say "making progress". I enjoyed it. Correspondingly Sharon and like to find quiet empty single track lanes and potter down them at 20mph. In fact there are times when we're chilled out and laid back we would like to go slower even on the main roads but we must not block the flow of other traffic. Then we like to up the ante a little and find traffic in our way. This is part of what made this year's trip to Spain so good. The quiet roads in the Picos allowed us to ride at the speeds we wanted depending on our mood and our surroundings. However we must share the roads. Ideally we would all find the correct balance between speed to allow progress of ourselves and other vehicles and a lack of speed to increase safety and reduce risk. If we wanted totally safe roads then the limit would be 10mph - everywhere. Even then there's a tiny risk. Imagine though a trip from Bolton to Cornwall would take 32 hours. If we all wanted to be there ASAP then we'd have no limits anywhere but the carnage would be horrendous. I suppose you could call it population control? Yes NigelS, it's hard not to notice the lack of police along with the corresponding drop in driving standards due to a lack of enforcement. Beautiful Upt'North. But a beer? No thanks, a nice hot cuppa for me while looking over the wonders of nature. I've been teetotal since I was 19. Not drinking has been good for me. Flibble. Wibble. Groink. I'm fine...yik. And now you know Ren that I can't possibly resist posting g a picture of the beer! It was 39 degrees c and that's a view towards the Grand St.Bernard. Nigel, it would seem you imply that speed limits are not the issue it's the people who ride/drive badly and exceed speed limits. I kind of agree. But do speed limits save lives? Depends on who you listen too, there was a study in Sweden (the Swedes like studies) some years ago where it was found that reducing speed limits on 3 lane roads did not improve KSI figures. I'm beings selective with details, but isn't that also kinda the point. Lies, damn lies and statistics. I think we all agree with each other that inappropriate speed is bad and yes I'm also glad I don't ride in the Derbyshire Dales too often these days ( it used to be a regular) it is full of motorcyclists whose enthusiasm exceeds their abilities. It isn't just an English issue though, in one short stretch of the Stelvio this year the amount of bike parts on the road, police, paramedics, recovery vehicle's etc was alarming. Also like you said Nigel, the lower 50 mph speed limit doesn't seem to be having such a calming behaviour on some riders. Should we lower it to 40, 30 or ban motorcyclists altogether for being bad people? Posted and critically, enforced on wide open A type roads. Police and cameras everywhere. What do we want, Draconian speed limits and a speed enforcement camera every 100 yards or sensible speed limits which are safe (within reason) when drivers/riders aren't looking at their 'I' link every 5 seconds? Don't get me started on mobiles! Have a good day y'all and Ren, I do love a mug of char.